Zero turning radius ability is the hallmark of the Detecto 6880 lightweight rolling chair scale. Ergonomics dictated this stylish, battery-powered chair scales contemporary design. This chair scale comes complete with a large LCD display, 440 lb capacity, and is sensitive to 0.2 lb. Oversized 3 inch diameter wheels and sleek styling allow this scale to be extremely portable. The large, 0.7 high contrast LCD display is battery powered and is easily readable in the brightest lighting conditions. The soft, padded armrests fold out of the way to allow patients easy accessibility. 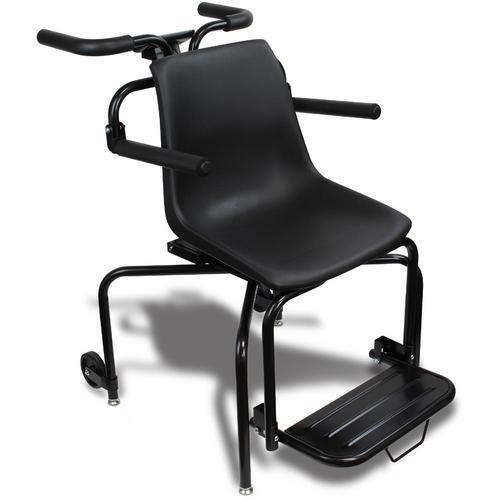 The Detecto 6880s footrests also fold away to promote patient security when getting into or out of the scale.